Although there is broad agreement that preparing global citizens for the digital age is a core responsibility of educators and schools, there is debate and uncertainty about how best to prepare students for this future. 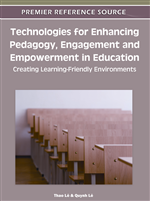 Technologies for Enhancing Pedagogy, Engagement and Empowerment in Education: Creating Learning-Friendly Environments explores how technology-based learning can enhance student engagement, performance, and empowerment. This book provides researchers, educators, and practitioners with insights from educational programs, classroom teaching, and theory-into-practice research; places educational technologies appropriately in their social and cultural contexts; and reflects upon challenges and problems in evaluating and implementing changes in the field. It shows how computer-enhanced education can improve teaching and learning without confusing the increase of computer facilities with the quality of education. Please do not hesitate to call or e-mail us if you have any questions or need assistance. We are always willing to help.